One of Jakob Silfverberg’s most memorable hockey moments was watching a fellow Swede net the gold medal-winning goal on the Olympic stage. 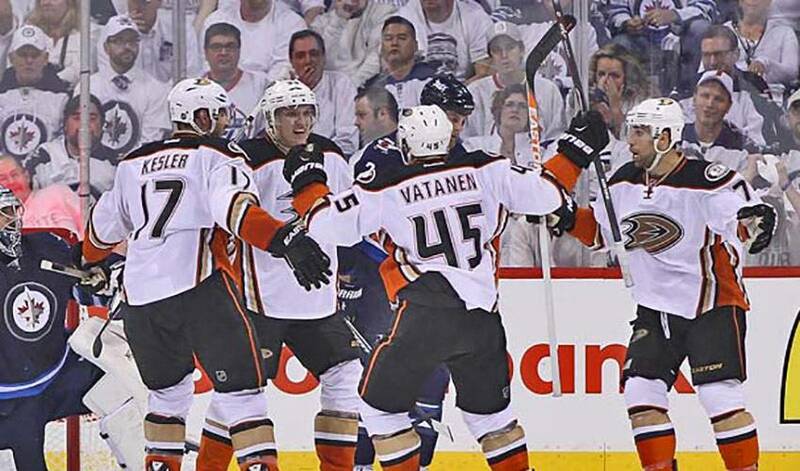 On Monday night, the Anaheim forward had an unforgettable game of his own. Playing in front of a raucous “whiteout” crowd in Winnipeg, Silfverberg and the Ducks quieted the Jets faithful by earning a 5-4 overtime win and with it, a 3-0 lead in their Western Conference quarterfinal series. A native of Gavle, Sweden, Silfverberg had one goal and two assists. And while his performance won’t grab the same headlines as Swedish Hall of Famer Peter Forsberg’s golden goal at the 1994 Winter Olympic Games, Silfverberg was no doubt at the top of his game in Winnipeg. STAT PACK: Silfverberg had the game-winning tally against Winnipeg in Game Two, scoring on his only shot on net, taking 27 shifts in 18:50 of ice time. NEED TO KNOW: Silfverberg was voted the Best Swedish Forward at the 2008 Under-18 World Championships. ALL IN THE FAMILY: Jakob's father Jan-Erik was a defenceman with Brynäs IF for 11 seasons, winning four Swedish championships and a silver at the 1977 World Championships. Jakob's uncle, Conny, also played for Brynäs, winning a Swedish championship in 1980 and was the points-leader for the 1984-85 Elitserien season. HOMETOWN HEROES: Silfverberg shares the same hometown as Nicklas Backstrom, goaltenders Jacob Markstrom and Anders Lindback, and forward Elias Lindholm. HONOURABLE MENTIONS: Devan Dubnyk (17 saves) notched his first career shutout in a 3-0 Minnesota win over St. Louis. Zach Parise (1G, 1A) also came up big for the Wild. Henrik Lundqvist (23 saves) was at his best in the third period of a 2-1 New York Rangers triumph over Pittsburgh. Andrew Cogliano had three assists in Anaheim’s victory.